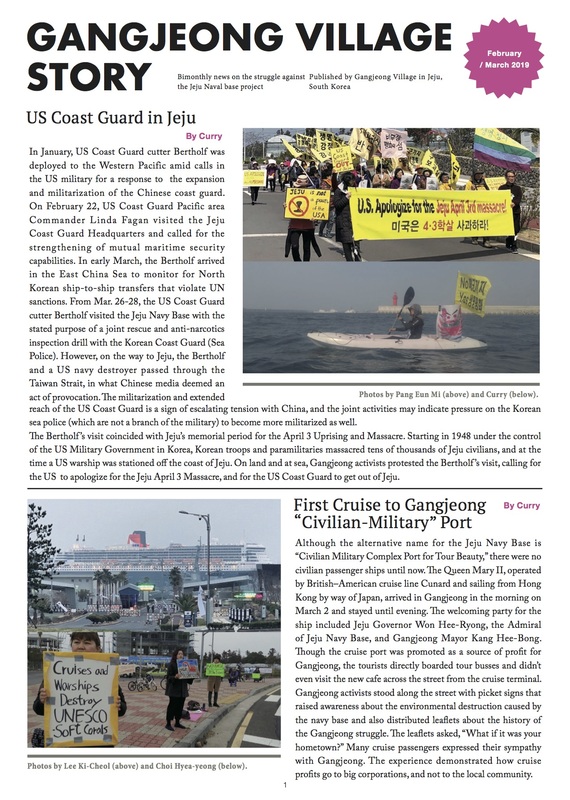 Otherwise, Dr. Song Kang-Ho has written an article on the meaning of the Jan. 27 event for the monthly newsletter. See the top article in its 1st page, here. 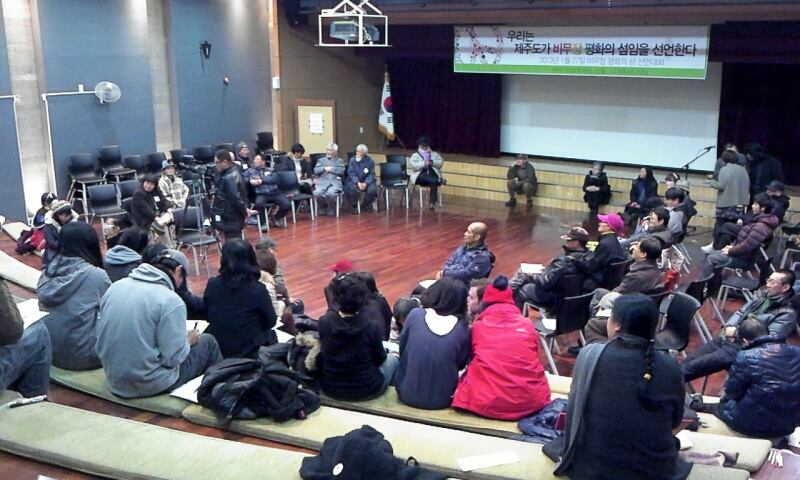 On Jan. 27, we, gathering at the Jeju 4.3 Peace Park, declared that “the Jeju Island is the demilitarized Peace Island.’ It was to emphasize that the Jeju should not be armed but be the Demilitarized Peace Island with neither military nor military base. For that, we, the 111 declarers, made a resolution to realize the Demilitarized Peace Island by constant practices and peaceful efforts not merely by one time declaration event. 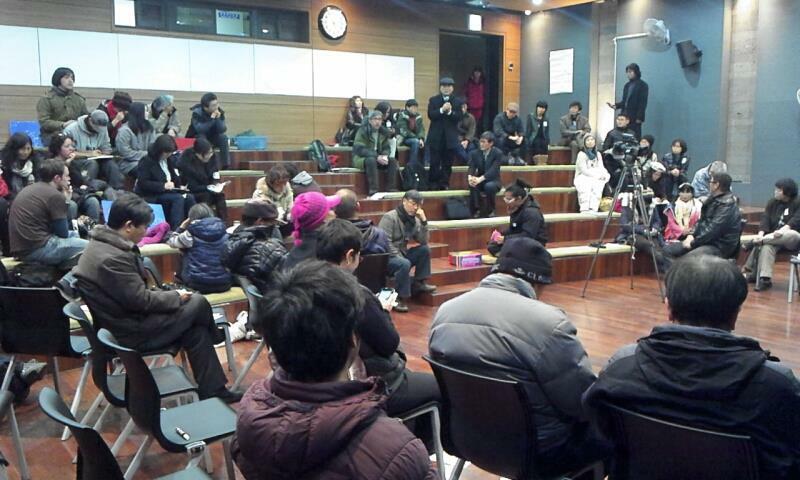 We also decided to hold the 2nd meeting to make the Demilitarized Peace Island in front of Gwandeokjeong (*see the bottom) on March 1st, to reconfirm our resolution and practical will and to share the will with many more citizens. March 1 is the 94th anniversary of the March 1 movement [ in 1919] when [the Koreans] declared that Korea is a self-reliant and independent nation in a non-violent and peaceful way, against the violence of Japanese imperialism. It is also a date when the ceremony commemorating the 28th anniversary of the March 1st was held in Jeju [in 1947] that became the fuse of Jeju 4.3 uprising. 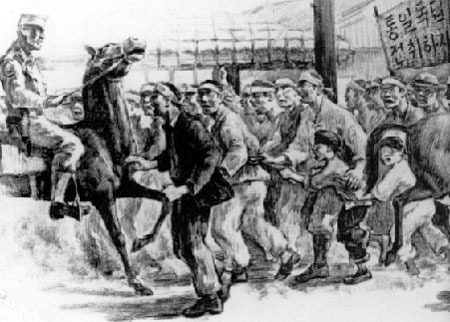 Drawing on the incident of March 1st, 1947, by Kang Yo-Bae, Jeju artist. The drawing is included in his famous drawing book on 4.3 incident (Source). The current political prisoner, Yang Yoon-Mo has a personal historical connection to the incident. See here. The Gwandeokjeong is the place that has been with the history of Jeju. It was the historic site at the time of Lee Jae-Sou-led uprising in 1901 ( *Jeju people’s uprising against the dominance and oppression by the French Catholic Missionaries) and 3.1 ceremony in 1947 when about 20,000 people gathered. It is the site of the living spirits of the patriotic forefathers who resisted against the wickedness of foreign power and made efforts to save the precious Jeju Community. The reason that we set ‘the Gwandeokjeong, March 1’ for the date and venue of the event is to succeed the spirit of our forefathers. It is to cherish the memory of the patriotic forefathers who faced against unjust violence and to break through the deplorable reality in which justice is suffering. Participation by the conscientious citizens who love peace becomes the force to change the world. We have a confidence that a small action can fill you and your children’s future with peace. We oppose the Jeju naval base. Yang Yoon-Mo who was imprisoned for the forth time and is making prison fast, risking one’s life, urgently hopes your participation as well. We invite you to the Gwandeokjeong on March 1. _We are preparing for the programs for children. Family participation is welcome! _If you bring any snacks, we will share those in the small group discussions. 4) By what will the Jeju Island make living? 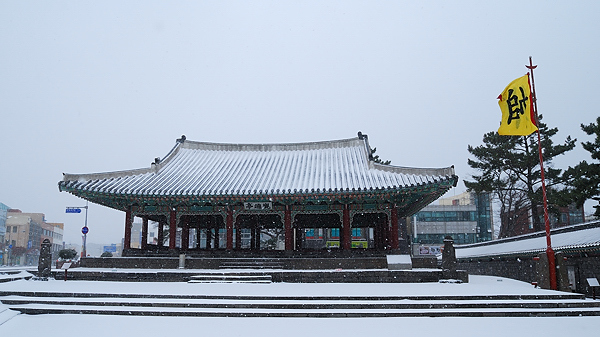 What and where is the Gwandeokjeong (제주 관덕정)? Source: A Korean Travel Journal blog/ The Gwandeokjeong, Jeju, was originally built in 1448 for a military training of archery.